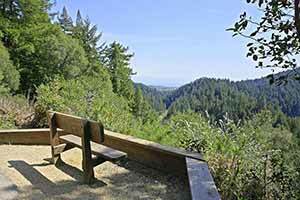 The Fall Creek unit of Henry Cowell State Park occupies a steep canyon on the side of Ben Lomond Mountain. 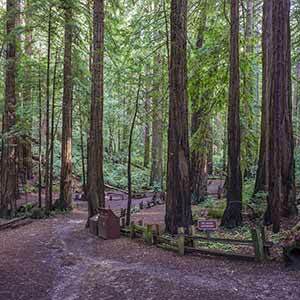 The park is almost entirely wooded with dense second-growth redwood-dominant forests. The main attraction, though, isn’t the redwoods but the extravagantly lush canyon bottom with its lively creek and abundant redwood sorrel groundcover. The lower Fall Creek Trail is a popular year-round destination for locals, and the small parking lot often fills up. Horseback riding is allowed throughout the park. The first half of this hike is a strenuous climb through young second-growth mixed woodland, ending at the Big Ben tree. 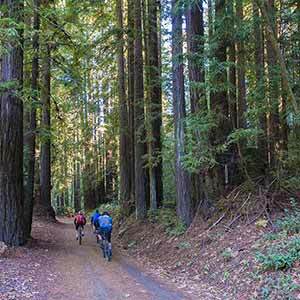 This is followed by a descent through lush second-growth redwoods along lively Fall Creek. With all the climbing, you might expect some great scenic vistas, but the route is wooded the entire way and there are no panoramic views. 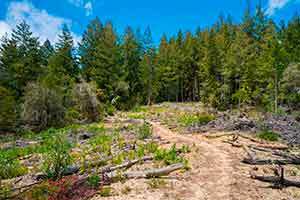 Throughout the hike, the woods are pleasant if not spectacular and signs of logging are frequent. The hike is most enjoyable on rainy winter days, when the creek is full and the woods look especially lush. The trails stand up well to rainfall. All the trails are very quiet, althogh sometimes the distant hum of Highway 9 can be heard. The hike starts on the Fall Creek Trail, which ascends gently alongside the rushing creek. This part of the Fall Creek Trail is the most scenic and popular part of the hike; most visitors only go as far as the limekilns and then turn back. In this area the trail is wide and has only a gentle grade. 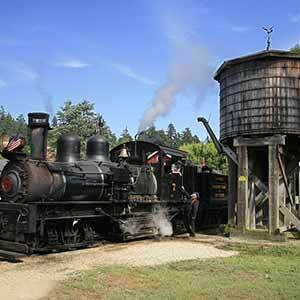 It runs alongside the large creek, under an exceptionally lush second-growth redwood forest. Redwood sorrel carpets the ground. Turn left at the first intersection to climb to the limekiln site, which is interesting if not especially scenic; the woods around the site are less attractive and lush than along Fall Creek. 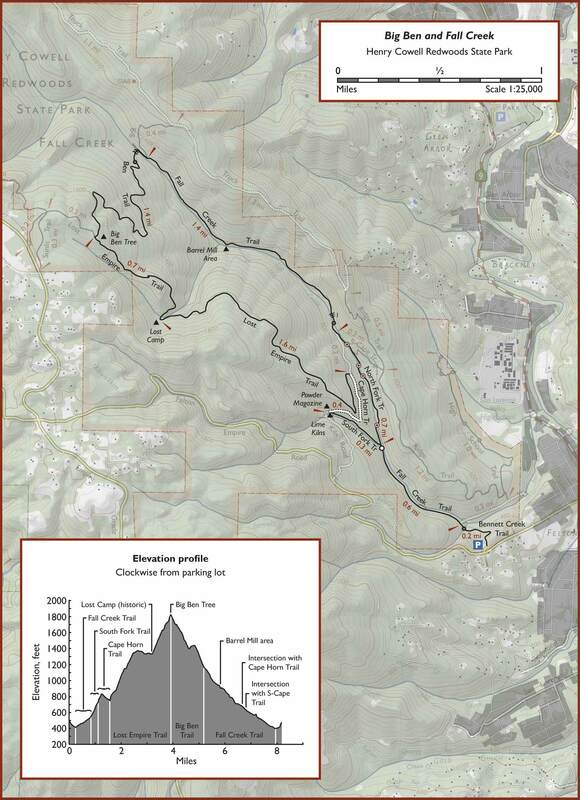 Continue on the Cape Horn Trail and turn left onto the Lost Empire Trail. 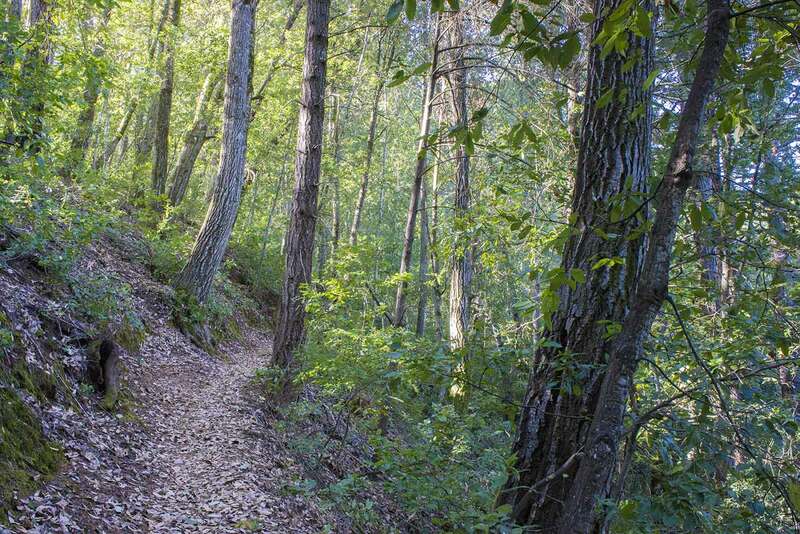 This latter trail follows an old sunken roadbed that climbs steeply along a ridge and then levels out. This is the least enjoyable part of the hike, with heavily-logged and somewhat unattractive woods. However, the scenery improves as the trail enters the lush side canyon where Lost Camp is located. Lost Camp is a historic site, not a campground, and doesn’t have anything to see. The scenery improves quite a bit after Lost Camp. 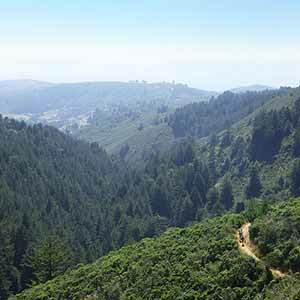 The trail narrows and becomes true singletrack, again climbing steeply along the ridge, and the bright, open forest of tanoak and scattered redwoods is noticably more attractive. 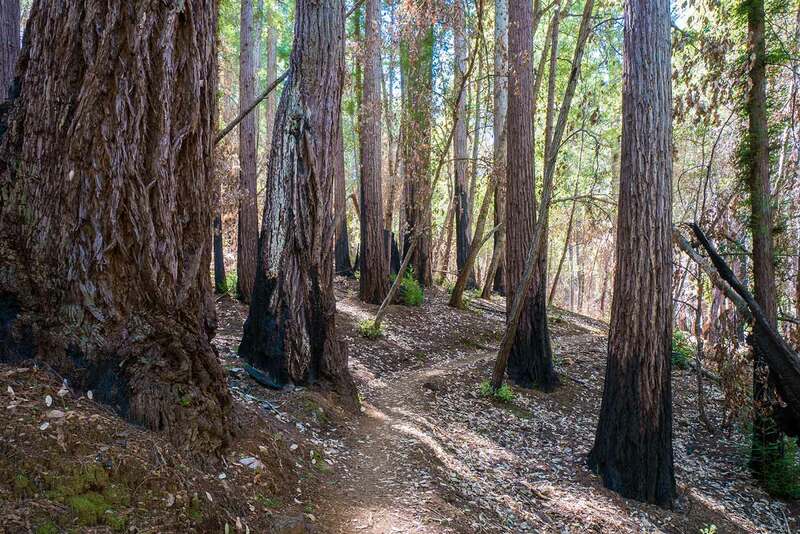 The redwoods are small and somewhat sparse in this area, but there aren’t any stumps and the clumps of small redwoods normally found in logged areas aren’t present. 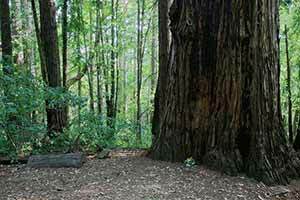 The Big Ben tree is a mid-sized redwood at the intersection of the Big Ben and Lost Empire trails. 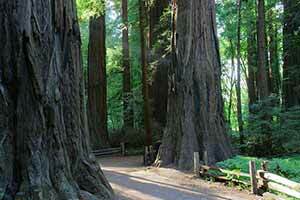 It’s the largest in a cluster of what appears to be old-growth redwoods. At about 6 feet in diameter it’s one of the largest trees in the park, but by old-growth standards it’s nothing exceptional. People often make the short hike from Empire Grade to see this tree. At the Big Ben Tree, turn right onto the Big Ben Trail. The stumps re-appear as the trail descends through very nice woodland to Fall Creek, but there are several more mid-sized old-growth trees along the trail. The forest gets denser and the sound of the creek becomes audible as the trail approaches the bottom of the canyon. 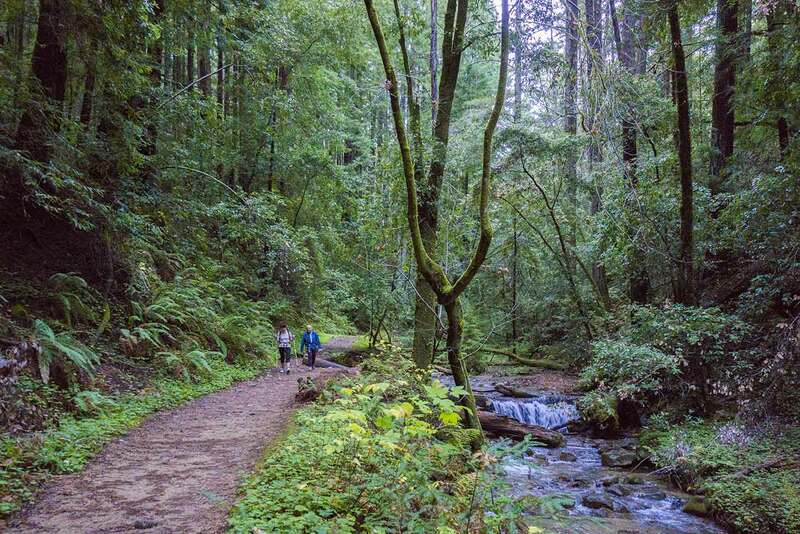 The Fall Creek Trail, which descends through a narrow canyon in the deep shade of lush second-growth redwoods, is the most enjoyable part of the hike. 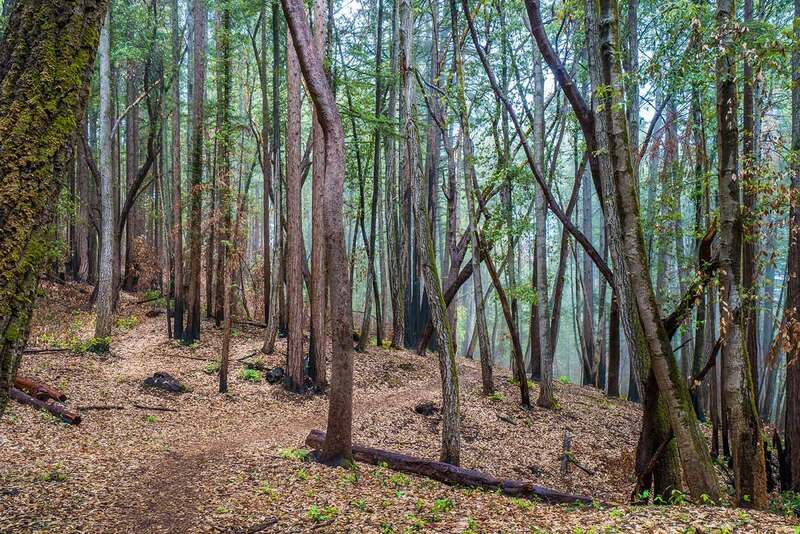 The trail is best at the top and bottom; especially below the Barrel Mill area the scenery steadily improves, the woods becoming lusher and denser. After the Cape Horn Trail intersection are four footbridges that often wash out in the winter.